100 ml of solution in plastic PVC containers. Clear Liquid, Colourless or with yellowish-greenish shade. Antibacterial means with antimicrobial activity, derivative of nytroimidazole. The preparation is active towards: Trichomonas vaginalis, Entamoeba histolytica, Gardnerella vaginalis, Giardia intestinalis, Lamblia spp. ; anaerobic bacteria; Bacteroides spp. (including Bacteroides fragilis, Bacteroides distasonis, Bacteroides ovatus, Bacteroides thetaiotaomicron, Bacteroides vulgatus), Fusobacterium spp., Veillonella spp., Prevotella spp. (Prevotella bivia, Prevotella buccae, Prevotella disiens), Eubacterium spp., Clostridium spp., Peptococcus spp., Peptostreptococcus spp. MPK for these culture is 0,125-6,25 mkg/ml. In combination with amoxicillin it reveals activity towards Helicobacter pylori (amoxicillin suppresses the development of resistance towards metronidazole). Anaerobic microorganisms and optional anaerobes are settled in the preparation, but in the presence of mixed flora (aerobes and anaerobes) metronidazole acts synergeticaly with antibiotics, which are effective towards aerobes. The preparation increases the sensitivity of tumors towards radiation, and has disulfurized effect, stimulates reparation processes. After 20 minutes intravenous administration of 500 mg Cmax in the blood serum becomes 35.2 mkg/ml in an hour, 25.7 mkg/ml in 8 hours, 33.9 mkg/ml in 4 hours; Cmin during continuous introduction � 18 mkg/ml. During normal gall-formation the concentration of metronidazole in gall after intravenous injection can considerably exceed in plasma. Combined with plasma proteins � 10-20%. Vd with adults � 0.55 l/kg, with infants � 0.54-0.81 l/kg. Metronidazol possesses high penetrating/ infiltrating ability. 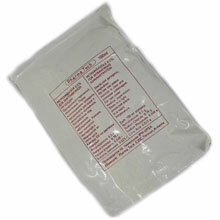 Reaches to bactericidal concentration in lungs, kidney, liver, brain, skin, spinal fluid, gall, saliva, amniotic fluid, abscess cavity; vaginal secretion, seminal fluid, pectoral milk. Penetrates through hematoencephalic barrier and passes through placental barrier. Basic metabolite � 2 oximetronidazole � has antibacterial and antimicrobial effect. Is moved out/deducted through kidneys (60-80%), 20% - in immutable form, deducted through intestine 6-15%. T1/2 is deducted in 8 hours (6-12 hours). Renal clearance � 10.2 ml/min. � pseudo-membranous colitis(in result of using antibiotics). � prophylaxis of post-operational infection (especially after operation on colon, near rectal tract, appendectoma after gynaecological operations). Recommended for intravenous drop injection to adults and children above 12 years initial dosage being 0,5-1g (injection duration being 30-40 min). Then adminsitred 500 mg in every 8 hours with rate up to 5 ml/min. If after the first 2-3 injections endurance is satisfactory then it could be passed to flow injection. The course of treatment is 7 days. If necessary the treatment through intravenous administration is prolonged. Maximum daily dosage is 4 g. According to indications it could be followed by supporting administration in the dosage of 400 mg - 3 times a day. During suppurative-septic diseases usually 1 course of treatment is implemented. For prophylactic purposes the preparation is prescribed as an injection for adults and children above 12 in the dosage of 0,5-1 g a day before the operation, on the day of operation and on the day following the operation � 1,5 g a day (500 mg in every 8 hours) After 1-2 days intravenous supporting therapy starts. For patients with chronic renal deficiency and the quantity of ciratinine less than 30 ml/min maximum daily dose is 1 gr. Nervous system: dizziness; hypotaxia (incoordination), ataxy, mental confusion, irritability, depression, heightened excitability, weakness, insomnia, headaches, cramps, hallucination, peripheral neuropathy. Allergic reactions; skin rash, nettle-rash, skin hyperemia, fever, stuffiness in nose, arthralgia. Local reactions, during intravenous injection � trombophlebitis (pain, reddening, hydropic syndrome). � hypersensitivity towards the preparation. The preparation is contra-indicated for usage in the 1 st term of pregnancy and during breast feeding. The preparation must be prescribed cautiously in the II and III terms of pregnancy. Data regarding overdosage is missing. It should be taken into consideration that during the usage of the preparation the use of ethanol is contra-indicated, as since development of disulfiram reaction is possible (spastic pains on the abdomen, nausea, vomiting, headache, sudden rush of blood to face). During long term therapy hematological indicators should be controlled. If neurological symptoms will be developed the usage of the preparation should be terminated. After the treatment of lambliosis (girardiasis) (if the symptoms remain) after 3-4 weeks it is necessary to hold 3 analysis of faeces by few day intervals (in some successfully treated patients permanent lactose and could remain for few weeks or months looking like lambliosis). It is not recommended to use the preparation in combination with amoxicyline for patients under 18. During simultaneous usage of Metronidazole � ACOS with preparations of lithium salts increase of lithium concentration in blood plasma as well as development of intoxication symptoms are possible. Sulphanilamids amplifies/enlarges the antimicrobial effect of Metronidazole. During simultaneous usage with enthanol disulfiram reactions are noted. PHARMACEUTICAL EFFECT Intravenous administration of Metronidazole with other medicinal preparations is not recommended.